As the Diocese of Connecticut is revamping its ordination process, I am a part of its new Commission on Ministry. We have been watching videos from prospective postulants who are interested in being part of a provisional phase of that process. They are really wonderful testimonies to the faith, witness, and hope of each of these people offering themselves for service in the Church. One of the metrics I developed as I watched was what I call the “J Count”. The J Count is simply how frequently does the applicant mention Jesus in some way or another. It gets a little more complicated in that my formula also scales the points based on how early in their presentation the count begins. Now I have thought of this as purely a matter of interest. Yet, it was indicative of something deeper. Those candidates I found myself most drawn to were those who had something to say about Jesus. Something about Jesus had drawn them in and was calling them to serve him in a new way. Recently I have read a few articles from Episcopalians on the future of the Church. Some of them are good and interesting. Yet they have no “J Count”. I don’t see in them a clear and compelling vision beyond a mission statement that the United Way might offer. I read a strategic plan for a parish that had lots and lots of talk but almost no J Count. I realize that many will say that it is implicit in our conversation. It is assumed. People know that’s what we’re talking about. Yet, I think it is a deep oversight on our part and a troubling one. In this culture we can no longer afford to assume anyone knows anything about Jesus. We have the obligation as the Church to say more about him (and less about us). Being Church will no longer be about educated and previously formed Christians choosing this or that parish based on their programmatic offerings. Those churches that thrive in the new environment will be those that offer a compelling reason not only to follow Jesus but to become a part of the Body of Christ. I realize this puts us in the awkward position of making some unique claims about Jesus. Make them. Make the unique claim that the life of Jesus, the death of Jesus, the Resurrection of Jesus, and the reign of Jesus are unique and all consuming. The Episcopal Church may operate in a pluralistic culture yet we are not a pluralistic body. We are one body with only one claim to uniqueness in our cultural landscape – we offer unity in holiness with Christ. As I talk with folks from around the Church interested in starting young adult service programs like Saint Hilda’s, one piece of advice I give them all is that if it is not going to be about forming faithful Christians, then why bother? The same goes for the Church. 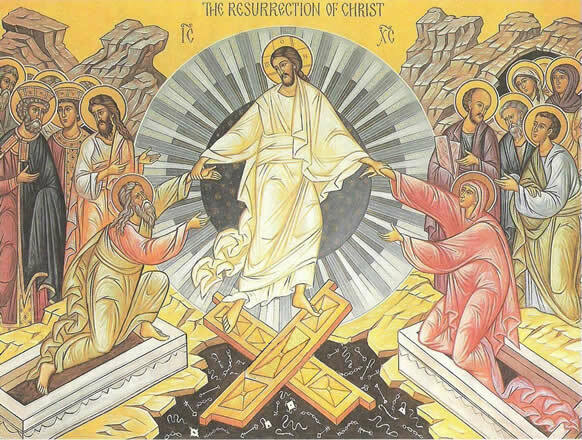 If we cannot, with boldness and foolishness, proclaim the saving power of the resurrection then why would any other claim we have, any other assertion we can possibly proclaim, have any validity or value? No claim of the Church can be offered without the imprimatur of the cross and without finding its heart in the unique proclamation of Christ. Our calls for justice can only have as much force as our assertion of the uniqueness of Christ’s life, death, and resurrection. The love of one another is the response to God’s love for us in Christ. It is the love of Christ poured out on the cross that provides our model for mission and evangelism in the world. We cannot allow ourselves to believe that there are cultural, religious, or political limitations to the love of Christ which we are bound to share with the other. For missionary churches in the post-colonial era, there is a degree of guilt present in the collective consciences of those sensitive to the evolving awareness of our collective guilt for the abuses of the past. This awareness is, in some part, a healthy regard for the other and a movement toward accepting the legitimacy of a variety of worldviews and histories without seeing them as invalidating one’s own. However, this awareness has also resulted in, what some would argue, is a potentially crippling reluctance to engage with the other in an open and honest way for fear of reenacting historical abuses or reinforcing past prejudices. By neglecting fulsome, on-the-ground evangelism efforts in favor of grant-giving or charity, the church has engaged in behaviors of dysfunctional rescuing, avoiding contact, and denying differences. Mission and evangelism are our Church’s Confession that we still have much to learn from the world around us, that we are willing to be vulnerable to the work of the Spirit, and to admit that our blindness, fear, or even laziness have habituated our institutions to simultaneously old and new forms of discrimination. The missionary enterprise, rooted in the open and confessing spirit, expressly engages the other, recognizes differences, and seeks reciprocal friendship rather than the false hope of “rescue.” Our amendment of life takes place in moments when we act in love, partnership, and openness with others. This joyful amendment of life, in the constant reflection and refraction of the confessing spirit, reverberates through the web of individual relationships the Christian is blessed to be a part of. No act can be more respectful of another than to share with them that which is most essential to our identity. Pretending that our faith does not call us in specific and powerfully unique ways does a disservice to us and to those with whom we would be in relationship. Evangelism need not be the powerful overwhelming the less powerful. It must be the encounter of the vulnerable sharing a Good News which has opened their heart and soul to the world around them in new ways – ways we can scarce contain. It must also be listening for the Good News others are sharing with us as Jesus continues to speak in ways we often least expect. The challenge of evangelizing in a world of difference cannot be met by indifference to that which is essential to our faith – the person of Jesus Christ. This is the heart of any Christian ministry – Jesus has so changed us and called us that his name is on our lips. His life is ours to know. His cross is ours to carry. His resurrection is ours to proclaim. His love is ours to share. Amen. Fellow presbyter and follower of Jesus. I just want to say Amen. I couldn’t agree more with your sentiment! While at Sewanee, I told my fellow seminarians, “Unless you are preaching the O.T. lesson, if you have not mentioned Jesus in the first 3 minutes of your sermon, I am taking a tap.” There are various reasons for what you have touched I suspect. I have listened to Good Friday sermons that didn’t mention Jesus even once! What drives me even crazier is when in the final paragraphs of a sermon the preacher launches a barrage of “Jesus,” as if acknowledging they have to make up for the rest of it. If we are proclaiming anything other than Christ, we are in actuality proclaiming ourselves rather than the Gospel. Thanks, Robert. You say such important things so well.